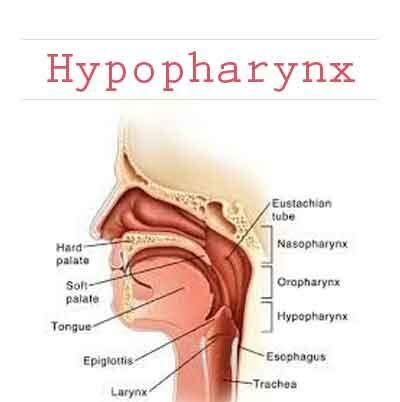 Hypopharynx is a highly important anatomical site as physiologically it is a component upper aero-digestive tract and it also represents a common conduit for both respiration and deglutition. Hence, any tumor or treatment of tumors in this area will produce disturbances in swallowing and inevitable aspiration. Tumors arising in this area often present in advanced state and so, key to cure lies in early and accurate diagnosis and prompt treatment. It is triangular space extending from the level of hyoid bone above to the lower border of cricoid cartilage below. The hypopharynx consists of three regions- pyriform sinus on each side, the posterior pharyngeal wall, and the post cricoid region. Pyriform sinus (PFS)- It represents channels formed on either side of the larynx. It is bounded by pharyngoepiglottic fold superiorly, the apex inferiorly, thyroid cartilage laterally and hypopharyngeal surface of AE fold medially. Posterior pharyngeal wall- It extends form floor of ventricle superiorly to inferior border of cricoids cartilage inferiorly and from one apex of PFS to the other. Post-cricoid region- It extends from at the level of arytenoids cartilage and connecting folds to inferior border of cricoids cartilage. The hypopharynx is lined throughout by squamous epithelium. The pyriform sinus has rich lymphatic supply. In general, the lymphatic in this area drain in deep cervical lymph node at level IV but inferior part of PFS and post cricoid area also drain in paratracheal lymph node in level VI and posterior pharyngeal wall drain in retropharyngeal area. Almost all carcinoma of hypopharynx are SSC carcinoma in type. PFS comprise maximum of around 50% of total, postcricoid tumors make up around 40% and posterior pharyngeal wall make up remaining around 10%. Tumors of PFS can be divided into those which primarily involve the lateral wall or the medial wall. Those arising from medial wall are more extensive and involve AE fold and paraglottic space and can therefore fix the hemilarynx on that side. Occasionally it can involve postcricoid area where vocal cord fixation can occur if cricoarytenoid joint is involved. As PFS is rich in lymphatic supply, 70-75% patients of pyriform fossa tumor have palpable neck mass at presentation which usually involve level II-IV deep cervical node and 5% have bilateral node at presentation. Epidemiology- Age specific incidence of pharyngeal cancer show an increase risk of developing disease with increasing age for both men and women. Postcricoid tumors remain the only SSC of head and neck that is more common in women. The overall incidence of tumor in UK is approximately 1-3 per 100000. Alcohol and tobacco remain the two principal carcinogen implicated in the tumors of the upper aerodigestive tract, to include the hypopharynx and they are synergistic to each other. A major dietary risk factor (iron deficiency) in relation to postcricoid carcinoma has been described particularly in patients with Plummer-Vinson syndrome. This syndrome is associated with anemia, glossitis, esophageal web, koilonychias and achlorhydria. Some also have a history of radiation to the neck. The clinical picture caused by a large tumor is often unmistakable, but in the early stages the symptoms may be indefinite. Whilst the feeling of lump in the throat, which is worse on swallowing saliva is rarely of serious significance (e.g globus pharyngicus) or persistent soreness, should always be treated with extreme suspicion, especially in elderly patients who smoke and drink. Persistent pharyngeal pain is nearly always a sinister symptom and if associated with malignancy it reflects deep invasion in larynx and pharyngeal structures. It is often associated with referred pain to ipsilateral ear. 1. Globus pharyngicus- It usually presents in young women as a sensation of a lump in throat in midline between hyoid and suprasternal notch but more commonly at cricoid level. It is intermittent and typically occurring between meals, when swallowing saliva, in the evening or during stress and, although uncomfortable but never painful. 2. Pharyngeal oesophageal motility disorder- in patients with throat symptoms who have no abnormality found on examination and investigation and diagnosis can be confirmed by barium video fluoroscopic swallow examination. 3. Benign tumors like Leiomyomas common in hypopharynx and upper oesophagus. 4. Lipomas and fibrolipomas occur occasionally. History and physical examination, Biopsy ,HPV testing suggested, Chest imaging, CT with contrast or MRI or PETCT and CT with contrast of primary and neck, Dental evaluation, including panorex as indicated, Speech & swallowing evaluation as indicated, Examination under anesthesia with endoscopy and Pre-anesthesia studies. Examination – All patients presenting with a throat complaint or a mass in the neck requires a full head and neck and general examination. Patients can be examined in OPD using either indirect laryngoscopy, a rigid Hopkin’s endoscope or FOL passed through the nose. Particular attention should be paid to obvious swelling or ulceration and also to the presence of pooling of saliva in pyriform fossa (Chevalier Jackson’s sign) and oedema of arytenoids. Presence or absence of laryngeal crepitus should be look for. Absence of crepitus means any postcricoid or posterior pharyngeal wall involvement. It is important to carry out any imaging studies prior to endoscopy and biopsy if possible since FNAC; endoscopic and open biopsy can all create artifactual features on both CT and MRI. Barium swallows extremely useful investigation in tumour involving postcricoid and cervical oesophagus. If Primary site: complete response then only follow up is required. If pt presented with Primary site: residual tumor then Salvage surgery + neck dissection as indicated. b) Alternatively Surgery: Partial laryngopharyngectomy (open or endoscopic) + Ipsilateral or bilateral selective neck dissection is the treatment of choice. If there are no adverse features like extracapsular nodal spread, positive margins, pT3 or pT4 primary, N2 or N3 nodal disease, Perineural invasion, vascular embolism only follows up is required. With Adverse features Chemo/RT can be consider. a) Induction chemotherapy x 2 cycles and follow-up. If Primary site: Complete response then Definitive RT can be considered. If patient presents with residual tumor in neck then Neck dissection can be done. If primary site: Partial response then planned for Induction Chemotherapy 3rd cycle and follow up. If primary site: CR then Definitive RT can be considered. If CR: only observation required. If Primary site: < PR then planned for Surgery. If pt is having no adverse features RT can be considered. With any adverse features Chemo/RT can be given. b) An alternative to induction chemotherapy – surgery Laryngopharyngectomy + selective (N0) or comprehensive (N+) neck dissection, including level VI can be consider. With adverse features Chemo/RT and follow up required. If Primary site: complete response but with Residual tumor in neck then Neck dissection can be consider. In case of complete response of neck then Post-treatment evaluation (minimum 12 wks) with PET, Contrast-enhanced CT or MRI and physical exam is required. If inv are negative only observation is required. And if inv are positive then Neck dissection is considered. If patient presented with Primary site: residual tumor then Salvage surgery + neck dissection as indicated. a) Surgery + comprehensive neck dissection (preferred) is treatment of choice followed by RT or Chemo/RT. b) Or alternatively Induction chemotherapy x 3 cycles and follow-up. If patient presented with Primary site: CR or PR and stable disease in neck then consider Chemo/RT. If Primary site: complete response but Residual tumor in neck then Neck dissection can be consider. If patient presented with Primary site: residual tumor after chemo/RT then Salvage surgery + neck dissection as indicated. If pt presented with Primary site: < PR or progression in neck after NACT then Salvage surgery + neck dissection as indicated. c) Third option is CCRT. If patient presented with Primary site: complete response but Residual Tumor in neck then Neck dissection can be considered. If pt presented with Primary site: residual tumor Salvage surgery + neck dissection is indicated. Prevention And Counseling : Abstinence of alcohol and cessation of smoking is first and foremost for prevention.